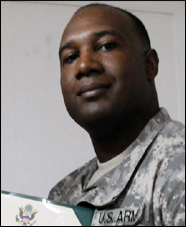 Army Staff Sergeant Baron Toms joined the military in 2001 out of Dallas, Texas. His family has a long-standing tradition of military service. On August 18, 2007, Staff Sergeant Toms was wounded during the second of his three deployments to Iraq. A rocket attack killed two members of his unit and injured Toms. The blast caused Toms to hit his head on a concrete wall, leaving him unconscious for a period of time. He has been diagnosed with Posttraumatic stress disorder (PTSD), and has honorably retired from the Army. Among the commendations awarded to Staff Sergeant Toms were the Bronze Star Medal, Army Commendation Medal (3x), Army Good Conduct Medal (3x), Army Achievement Medal (4x), National Defense Service Medal, Global War on Terrorism Expeditionary Medal, Global War on Terrorism Service Medal, Iraq Campaign Medal with Campaign Star 3x), Non- Commissioned Officer Professional Development Ribbon, Overseas Service Ribbon (3x), and the Army Service Ribbon. Staff Sergeant Toms, wife Maria, and their two daughters received a home in Temple Terrace, Florida.